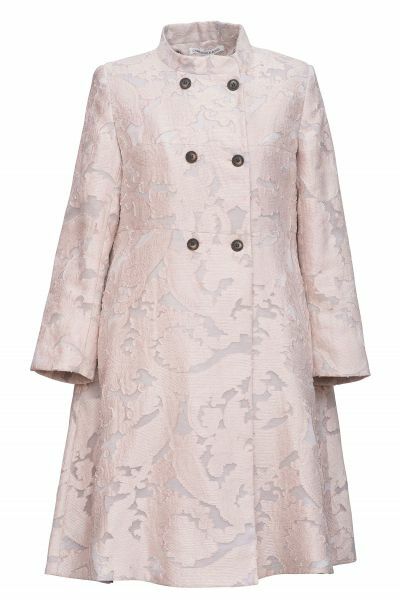 The perfect wedding, garden party at the Palace coat, or for spring days dressed down with jeans and sneakers - in a flattering layered A line cut in the prettiest pink woven lace. It is lined with a cool contrast lining to give the effect of depth and movement. A perfect party and wedding piece. WE RECOMMEND USING AN ECOLOGICALLY FRIENDLY DRY CLEANER FOR THIS GARMENT. THE OUTER IS MADE FROM 77% VISCOSE AND 23% POLYESTER. THE LINING IS 100% ACETATE FROM JAPAN. THIS IS A DRY CLEAN ONLY GARMENT. Please see our size chart for more information about the fit of our clothes. Styles will vary depending on the cut and the fabric they are made from and this guide is here to give general guidance. There is more information about the fit of each style in the Fit & Care Tab on each product page underneath the Add To Bag Button. If you require further information about the fit of a particular style, please contact us and we will be happy to help. The measurements are measured to the nearest quarter inch or centimetre. To achieve an accurate measurement for your bust, please measure around the fullest part of your bust. You do not need to measure over your shoulder blades for your bust measurement. To achieve an accurate measurement for your waist, please measure around the natural waist, keeping the tape measure taut but not tight. If you measure too tightly the fit will come up small. To achieve an accurate measurement for your hips, stand with your feet together. Measure around the fullest part of your bottom at the top of your leg, usually about 20cm (8’’) below your natural waistline. Please note the measurements given in the garment descriptions are taken from a size 10 or a small when laid flat, and unless stated, they are measured at the front of the body. We do not take measurements from the back body but please do get in touch and we will be happy to give measurements over the phone or via email for specific sizes and styles.